Renovations do not always contain complex changes and ideas. In fact, some of the best ones stick to just the bare necessities. Even with bathroom makeover, this holds true. We provide you with some simple remodel ideas for your bathroom in the following list. 1. The addition of glass shower screens around your shower and at times, a tub is a simple way to add convenience and style to your bathroom. Convenience in that these screens clean much easier than shower curtains do, and we mention style, as there are a number of different options in these screens available to you today. 2. Replace your single-sink cabinetry with one of the latest double-sink custom models to increase the functionality of the bathroom. After installation, no longer will you need to wait on your spouse to style your hair. Both of you will be able to groom your bodies and hair at the same time. Sinks also come in raised and sunken versions for cabinets on top of freestanding, half-sink, square, rectangular and round ones. Select the ones that best suit the rest of your bathroom decor. 3. Maybe you only need a new tub, shower or toilet in your bathroom. Today, there are some innovative designs for all of these that were not around years ago when your house was first built. The present stand-alone tubs add a modern twist to your old bathroom with their unique shapes and add-ons. Showers now come with massage jets, soap dishes, seats and even handicap bars built into their units. Toilets come in unique shapes and styles at present along with water-saving and other beneficial features. 4. 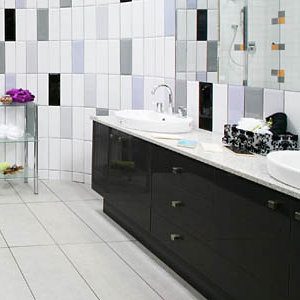 Tile walls and flooring are quite popular at the moment, as tiles come in a variety of colours, sizes and materials. Place a pastel colour on the walls to lighten and brighten the room while the medium to dark tones are ideal for the floor. Even non-slip ones are available for the floor, so you do not fall when the floor is wet. 5. LED lights create a special ambiance in the bathroom while they provide sufficient light for you to see clearly enough to apply your makeup, shower or perform other grooming duties. You even can even read a magazine, newspaper or book while tending to certain necessities if you get what we mean. 6. You may require a new mirror to replace the old one that has seen better days. Once mirrors age to the point of displaying all their flaws clearer than your image, it is beyond time to replace them. The list above shows you how simple some renovations can be with just a singular item. You may be similar to other homeowners, though, and need a professional to gut your existing bathroom to begin fresh. Let your budget and the shape of your bathroom be your guide to how complex your renovation must be, but remember, less is often enough to rejuvenate your bathroom.